Louis the young stork came into the world on a birch tree in Radolfzell on Lake Constance six or seven weeks ago. Until this day in June 2014, he has only known his parents and three siblings. But suddenly, strange beings have appeared at the nest and take the four small white storks captive. They are Andrea Flack and Wolfgang Fiedler of the Max Planck Institute for Ornithology and the University of Konstanz. In the coming years, the scientists will learn from Louis and other young storks that, on their migrations south, storks follow other storks who are particularly good at exploiting thermals, allowing them to flap their wings as little as possible as they fly. The efficient fliers migrate to West Africa, while the others spend the winter in southern Europe. From their data, the researchers can determine storks' destination just 10 minutes after the birds take off. Andrea Flack and Wolfgang Fiedler have been visiting storks' nests on the western shore of Lake Constance. The aerial ladder of the fire brigade raises them to the stork nests at lofty heights so that they can strap small tracking devices onto the backs of the nestlings. The aim is to follow Louis and 60 other young storks on their migration. The instruments, which weigh less than 60 grams, record the GPS coordinates of the birds' locations. They also measure the animals' movements using accelerometers. This allows the researchers to determine whether and how the birds are moving. For Louis and his nest mates, the harmless procedure is over in just a few minutes. Fully engaged in perfecting their flying skills, it is likely that they very soon forget the strange encounter with the scientists. For the researchers, however, the work has only just begun. 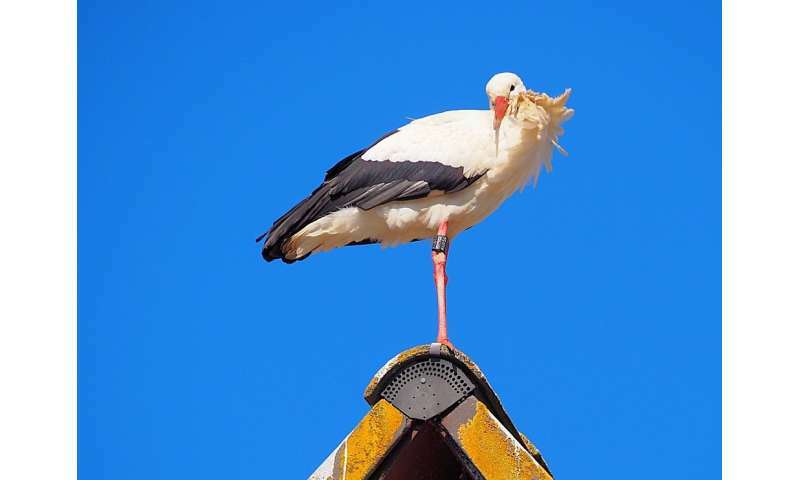 From now on, they will collect and evaluate huge volumes of data, because the tracking devices log the storks' GPS coordinates every second for two to five minutes every 15 minutes, over a period of weeks. Once a day, the devices send a text message containing the location and movement data via the local mobile network, just like a mobile phone. Louis, too, was fitted with his "mobile phone" on that day four years ago. As it turned out, he was the first among his nest mates to travel south. He joined a group of 27 other tagged storks. After five days of flying, 17 of them were still together. Never before have researchers tracked a group flight of storks as meticulously as Louis and his peers. The scientists of the Max Planck Institute for Ornithology and the University of Konstanz have now published the results of Louis' and his peers' voyage. The data from the thousand-kilometre stage show how a bird's flight performance, social behaviour and global migratory route are interlinked. Detailed analysis of the high-resolution GPS data shows that the flight paths of the leader birds are more irregular. "They are the ones who locate the thermals and search out the most favourable areas within them. "As a result, they have to adjust their flight paths repeatedly," explains Máté Nagy, who analyzed the data from the trackers. The follower birds benefit from the leaders' explorations and can soar upward in more regular trajectories. "When travelling to the next thermal, follower birds are a bit slower and lose altitude faster. To avoid falling behind the group, they must flap their wings more and leave the thermals before reaching the top." However, a stork's flying skill is not only linked to its position within the group. How much it flaps its wings also predicts where it will spend the winter. Animals that flap their wings a lot do not fly as far as those that flap less. Louis, for example, is a rather mediocre flyer. For him, it is better to spend the winter in southern Spain, especially since he can find enough food at the landfill site there. The situation is entirely different for Redrunner, another individual of the 27 tagged storks. He is one of the leaders of his group, and, therefore, manages to minimize his wing beats. He overwinters in North Africa. While Louis covered more than 1000 kilometres on his 2014 journey, Redrunner covered nearly 4000 kilometres. "The flight characteristics are so central to the birds' position within the group that we can predict just after a few minutes of migration flight whether it will spend the winter in Europe or fly on to West Africa," explains Andrea Flack. This is the first time that humans have been able to observe the group behaviour of storks on their journey across Europe to Africa in such detail. The collected data show that storks fly in socially structured groups, which are largely determined by the flying skills of the group members. "A stork's route and destination depend, among other things, on how efficiently it can fly," says Martin Wikelski, Director at the Max Planck Institute for Ornithology and Honorary Professor at the University of Konstanz. Since then, Louis und Redrunner have repeated their journey every year—and always with the same destination: Louis has remained faithful to Spain and Redrunner to Africa. This year, Louis arrived in Germany on 9 March. Since then, he has stayed in Neudingen near Donaueschingen and has built a nest with a partner on the local town hall. Redrunner also returned from Africa a few weeks ago. He has taken up residence in the town of Münzenberg between Frankfurt and Giessen.